The premiere of TOMMY AND THE WILDCAT was on December 18th 1999. The film became a big hit with Finnish audiences and gathered over 390,000 viewers and had an impressive run of 65 weeks in cinemas. A video of the film was released in autumn 1999 and also proved a success: with sales of over 85,000 copies, a record for a Finnish film, TOMMY AND THE WILDCAT was the year's most sold video in Finland. Patient work and substantial investments were required to ensure the film's success. Ville Suhonen wrote the first version of the story as early as 1993. It took producer Hannu Tuomainen a year to find sufficient financial backing for the film. The film was made as a rare Finnish (Wildcat Production), Danish (Balboa 2), Luxembourger (Samsa Film) co-production. Over half of the financing came from outside Finland. Ultimately, some 300 people took part in making the film. The shooting of the film began in August 1997 and was completed by late-March 1998. 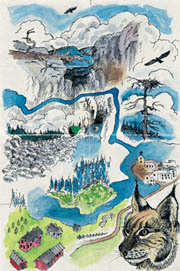 The film was shot entirely in the Ranua region and the pristine landscape of Korouoma in northern Finland during a total of 60 days. The Finnish and English versions were made of the film. All the scenes which had speech were first shot in Finnish and then the actors re-did the scene in English. Director Raimo O Niemi used Canadian actors for the final English re-voicing, which was recorded in a studio in Toronto. Thus, Konsta Hietanen appears to speak perfect English, but his voice is that of Michael Caloz, a young Canadian star. The English-language version of TOMMY AND THE WILDCAT was a great help in securing financing and distribution for the film. During its first year, partly before the actual shooting began, distribution rights had been sold to over 40 countries. This has provided TOMMY AND THE WILDCAT with the most international viewers that any Finnish film has had ever before.